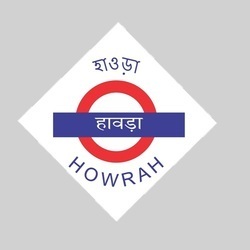 Over the years, we have established ourselves as a reliable firm engaged in manufacturing and supplying a wide array of Railway Signal Board of All Types. 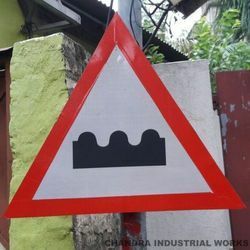 Under this category, we offer Bump Hump, Caution Board, Manned & Unmanned L-Xing Board, Stop Board, Termination Board (T/P & T/G) and many more at our premises, all these products are manufactured using modern methodologies. We offer these products in variegated specifications to meet the needs of different clients. These are applauded for their rugged construction and durability. Color 3M Make Retro Sheet- Yellow, Red,White. These Railway Retro Reflective Signal Board manufactured and supplied by us are widely appreciated among the clients for their uniqueness and corrosion resistance. Our signal boards are made in such a manner that they can easily withstand extreme weather conditions. We make use of quality-tested materials in manufacturing these boards, which are procured from trustworthy sources. Clients can avail our range at most competitive rates in market. 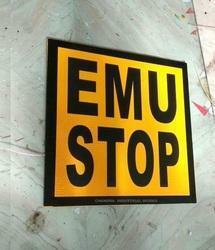 3M Make Retro Reflective Sing Board. Color 3M Retro Reflective Yellow Sheet. 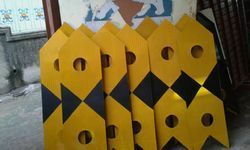 These Railway Termination Board Board T/P manufactured and supplied by us are widely appreciated among the clients for their uniqueness and corrosion resistance. Our signal boards are made in such a manner that they can easily withstand extreme weather conditions. We make use of quality-tested materials in manufacturing these boards, which are procured from trustworthy sources. Clients can avail our range at most competitive rates in market. These Caution Indicator Board manufactured and supplied by us are widely appreciated among the clients for their uniqueness and corrosion resistance. Our signal boards are made in such a manner that they can easily withstand extreme weather conditions. We make use of quality-tested materials in manufacturing these boards, which are procured from trustworthy sources. Clients can avail our range at most competitive rates in market. 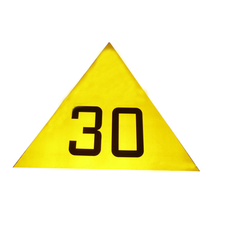 Color: 3m yellow sheet, black vynil. Lighting Type 3M Retro Reflective Sheet. These Whistle Boards manufactured and supplied by us are widely appreciated among the clients for their uniqueness and corrosion resistance. Our signal boards are made in such a manner that they can easily withstand extreme weather conditions. We make use of quality-tested materials in manufacturing these boards, which are procured from trustworthy sources. Clients can avail our range at most competitive rates in market. 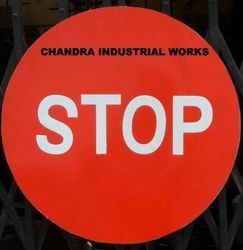 These Stop Board manufactured and supplied by us are widely appreciated among the clients for their uniqueness and corrosion resistance. Our signal boards are made in such a manner that they can easily withstand extreme weather conditions. We make use of quality-tested materials in manufacturing these boards, which are procured from trustworthy sources. Clients can avail our range at most competitive rates in market. as per Railway Standard drawing basis. Color 3m Yellow, & Black Vinyl Sheeting. These Speed Indicator Board manufactured and supplied by us are widely appreciated among the clients for their uniqueness and corrosion resistance. Our signal boards are made in such a manner that they can easily withstand extreme weather conditions. We make use of quality-tested materials in manufacturing these boards, which are procured from trustworthy sources. Clients can avail our range at most competitive rates in market. Color 3M MAKE RED & WHITE TYPE (IV) SHEET, BLACK VINYL SHEETING. Specification:- 3M Retro Reflective Sheeting Type IV (Red & White), Black Vinyl Sheet. Color 3M YELLOW TYP (IV) SHEET, & BLACK VINYL SHEETING. 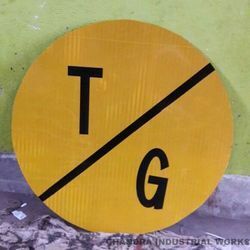 These Railway Retro Reflective Termination Board Board T/G manufactured and supplied by us are widely appreciated among the clients for their uniqueness and corrosion resistance. Our signal boards are made in such a manner that they can easily withstand extreme weather conditions. We make use of quality-tested materials in manufacturing these boards, which are procured from trustworthy sources. Clients can avail our range at most competitive rates in market. Railway Retro Reflective Manned Level Crossing Road Signal. To be used for Manned Lever Crossings. Color 3M Retro Reflective White & Red Sheet. 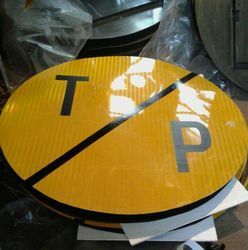 These Railway Speed Breaker Board manufactured and supplied by us are widely appreciated among the clients for their uniqueness and corrosion resistance. Our signal boards are made in such a manner that they can easily withstand extreme weather conditions. We make use of quality-tested materials in manufacturing these boards, which are procured from trustworthy sources. Clients can avail our range at most competitive rates in market. 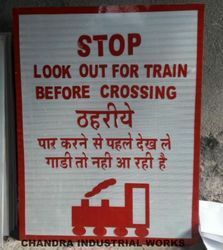 *Danger Board or Stop Board for Railway Unmanned Level Crossing Gate. *3M Make Retro Reflective Type IV Sheet. Dimension As per Railway Standard. Color P&C - White, G- Yellow. 1. P Marker : White Retro Black Letter. 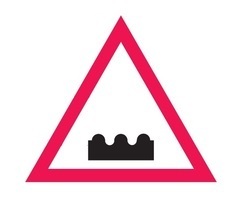 for Permissive Signal. 2. C Marker : White Retro Black Letter. for Calling ON Signal. Railway Retro Reflective Number Plate for Signaling Post. Sheet :- 3M Make White Color. 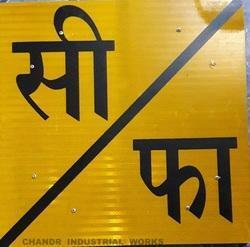 Letter & Number : as per Required Specification. Board :- MS Sheet or as per Specification.